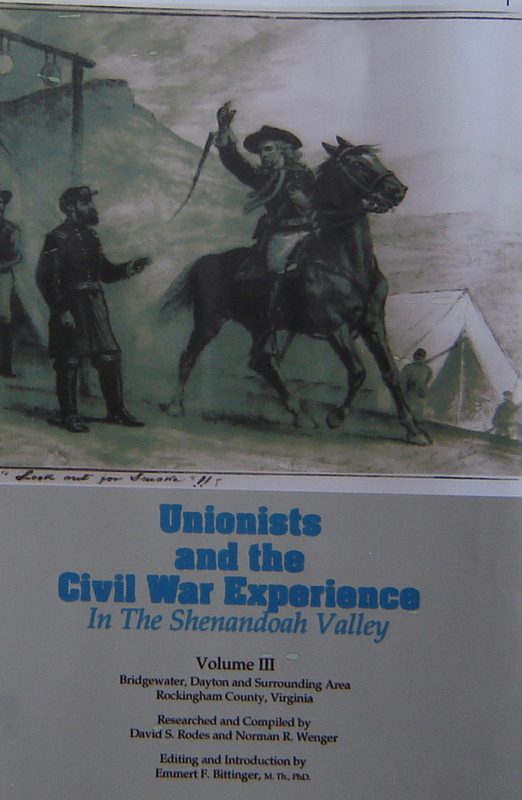 Valley Research Associates are recovering and publishing the claims made against the Federal Government by loyal citizens (Unionists) of the Shenandoah Valley for losses incurred while Union troops were camped on and around their farms: These Unionists lived in the South and suffered at the hands of both the Union Armies as well as their antagonistic neighbors who hated them for not supporting the Confederate Cause. The true extent and influence of the Unionists in the South has not been fully examined by historians. There were many thousands of them. Over twenty thousand submitted claims to the Federal Government. These records in the National Archives contain valuable historical and genealogical information most of which has never before been made public or seen the light of day. It is estimated that the material for Rockingham County alone will require the publication of six large volumes. The first was published in the fall of 2003, with Volumes Two through Four being published in the following 4 years. Volume 5 was published in 2009, and Volume 6 in 2013. These books begin to mine the rich social history pertaining to the Civil War. Here you will meet some of the devout, frugal and industrious folk who nurtured the agricultural bounty of the Valley only to see the fruit of this labor confiscated in random acts of violence and injustice during the war. Of particular interest are the families of Brethren and Mennonite descent, as well as families of the Methodist Episcopal and German Reformed Churches. Within these attractively bound hardcover volumes you will find stories of war-engendered suffering, loss of life and property, miscarriages of justice and struggles of conscience. Volume III - Highlights the stories of 56 families of Brethren, Mennonite and other faiths of the Bridgewater, Dayton, and rural areas of Rockingham County, Virginia. Volume IV - Highlights the stories of 60 families of Brethren, Mennonite and other faiths of Broadway, Cootes Store and Timberville areas of Rockingham County, Virginia. Volume V - Highlights the stories of 56 families of Brethren, Mennonite and other faiths in Mill Creek, Port Republic, Elkton and east side of Rockingham County, Virginia. Rockingham County businessmen Norman R. Wenger and David S. Rodes have researched the archival records of the Southern Claims Commission and compiled the claims these families submitted to the U.S. Government for compensation after the war. The claimants' stories, written by Emmert F. Bittinger, reveal physical hardship, struggles of conscience and fear of losing one’s life. Editor Emmert Bittinger, Professor Emeritus of Bridgewater College, has prepared the numerous documents for publication and written an insightful introduction to Volumes I-V. His comments and claim summaries set each in context and help the reader to understand the claim and how the Claims Commission responded to it. Listed below are the names of the 37 claimants in Volume I. In addition to each claim, the testimony of neighbors and family members opens windows of insight and understanding into each claim and the difficulties county residents experienced during this time. Now you can explore the personal struggles of families in Rockingham County, Virginia, who held to their convictions regarding slavery and war and maintained their loyalty to the Union during the Civil War. In Volume II of Unionists and the Civil War Experience in the Shenandoah Valley, you will meet 32 such families who lived in the Greenmount, Edom and Linville communities of the county. Listed below are the names of the 32 claimants in Volume II. In addition to each claim, the testimony of neighbors and family members opens windows of insight and understanding into each claim and the difficulties county residents experienced as the war raged up and down the Valley. John L. Heatwole, Valley historian and author of The Burning, sets the book in context. In the preface he writes, “Without addressing the impact of the war on the civilian population and the drama of dissent, the story of the Civil War is incomplete and one-dimensional.” Here are the areas and names of the families featured in Volume II. 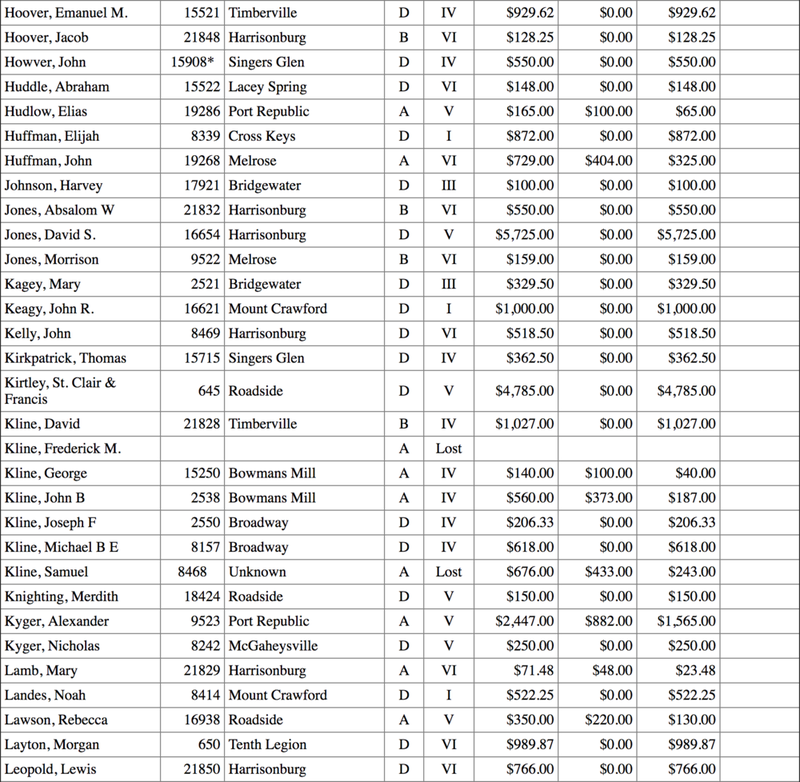 Listed below are the names of the 56 claimants in Volume III. In addition to each claim, the testimony of neighbors and family members opens windows of insight and understanding into each claim and the difficulties county residents experienced during this time. There are a total of 60 families described in this volume. Although most were strongly loyal to the Union and their losses major, only around a third received any payments. Under threats of death and loss of their property, they had been coerced at the polls to vote for secession. Explore the personal struggles of families in Rockingham County, Virginia, who held to their convictions regarding slavery and war and maintained their loyalty to the Union during the Civil War. 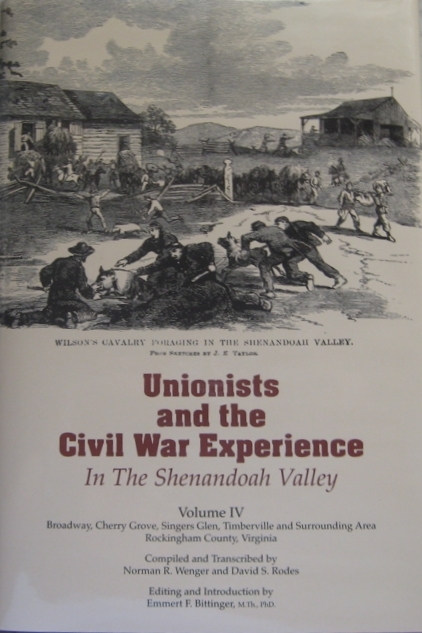 In Volume V of Unionists and the Civil War Experience in the Shenandoah Valley, you will meet 56 such families who lived in the Goods Mill, LeRoy, McGaheysville, Port Republic, Roadside and Harrisonburg Areas, Rockingham County, Virginia. Here are the areas and names of the families featured in in the 1193 pages of Volume V.
John Heatwole writes in the Preface, "Without addressing the impact of the war on the civilian population the story of the Civil War is incomplete and one-dimensional. If we exclude this story, we run the risk of glorifying the war as a stage set with banners flying, bands playing, and troops moving grandly over a sterile landscape." Listed below are the names of the claimants in Volume VI. Note: If the chart below does not load in your browser, click here to see the listing in pdf format.